Named after physicist and mathematician James Maxwell (June 13, 1831-Nov. 5, 1879), the set of equations describe how electric and magnetic fields are generated by charges, currents, and changes of the fields. 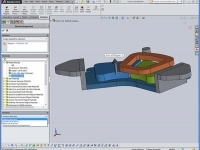 MagNet for SolidWorks sees user interface, post-processing and speed improvements. Supercomputing '09 attendees can see up to 8 teraflops of GPU performance in a 4U platform. Can't figure out how to integrate high-strength 3D printing into your manufacturing workflow? Try a new perspective. MicroStripes 7 automatic runs series of simulations that vary design parameters. Low-cost app focuses on practical concerns. Juniper Networks uses electromagnetic simulation to substantially improve itsproducts minus any additional manufacturing costs.